Whistling Wind Beekeeping – We need bees! If you’ve noticed a buzzing or constant humming sound coming from inside one of your walls, you may just have a bee infestation. They can move in rather rapidly, sometimes all in a day, but most likely they’ve been there awhile and you just didn’t notice them. They tend to go dormant in the cooler months of winter, so they’re very quiet then. They’ll get more active in the spring and summer when all the flowers are out. Here is some bee removal information that you can use. There is a type of wasp, usually called a Yellow Jacket, that have very similar markings as a honey bee. However, instead of eating nectar, making honey, and pollinating flowers, Yellow Jackets like to eat meat, other insects, and they like sugar as well. They also sting with little provocation, can sting multiple times, and can be aggressive. The best way to determine what you have is to first look carefully at some images online. 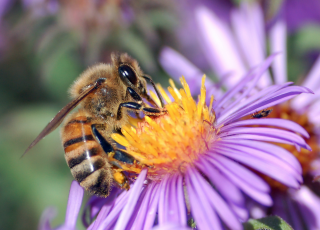 You’ll note that honey bees are very furry and hairy insects, while Yellow Jackets are smooth and brighter colored. If in doubt, capture one and look at it under a magnifying glass to be sure. The reason that it makes a difference is that there isn’t really any reason to call a bee removal specialist to take care of any kind of wasp. A pest control operator will drill a couple of small holes and fumigate the entire nest in a few minutes. Bees, on the other hand, are very beneficial insects that are in jeopardy of extinction now. If there is any chance you can save the entire hive, it’s worth a shot. 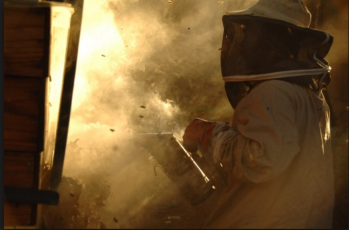 Most pest control companies don’t know how to handle bees, other than just killing them. If you ask, they really don’t like to deal with them at all. On the other hand, a lot of bee removal professionals only work with bees and they have special places that they take the hives so they can continue living and assisting nature with pollination. Bee removal technicians will have all the right clothing for the job. That includes a complete bee suit, you may have seen them on TV. Then, they’ll also have a special smoker that they can use to calm the bees while they extract the queen. Where the queen goes, the rest of the hive will follow, so that is the key to moving them. If you live in a wooded area, the bee removal personnel can just move the queen to a nearby site, then block their return to your home. This is the best option since most of the bees will be saved and they’ll still be in the same area to pollinate flowers, fruit trees, and other plants that need them to survive. If you think you have a bee problem, you can do your own investigating to start. But if you’re afraid of bees and wasps, you might be better off calling in the pros to begin with. They’re experts and will know exactly what they’re dealing with and how to solve the problem in quick order. If you have heard about Africanized bees in conversation or the news only once or twice, you might not know what they are, where they are from, or what they are doing. For a brief history of them and the growing threat they pose, keep reading the following paragraphs. Africanized bees are also known as Africanized honey bees, Africanised honey bees, and also colloquially as just “killer bees.” They are a hybrid species crossbred from Western honey bees with African honey bees and a few European species, such as Italian and Iberian bees. This brand of honey bees was brought to the South American nation of Brazil sometime during the 1950s. The hopes were that it could increase the production of honey there. However, there was an accident in 1957, and 26 known swarms were able to escape their quarantined environment. Free to roam in nature, these swarms began reproducing and travelling north, spreading throughout both South America and the Central American nations. They got to North America in 1985, and were detected in the California community of Lafayette in late 2015. The initial release was an accident, the result of a visiting beekeeper to the apiary in Sao Paulo, where the ancestor swarms were kept in heavily screened enclosures due to their hostile nature. After their release, their spread across two continents came completely unaided by humans, putting Africanized bees among the more successful of all known biologically invasive species in history. While they were confirmed in California in 2015, they’ve been in the United States for 30 years. An oil field in the same state found them in 1985, possibly having traveled with a South American shipment of piping. Permanent colonies were discovered later in Texas and Arizona in the early 90s. Africanized bees have overtaken other species as the predominant pollinators in South and Central America. Highly defensive, these swarms travel farther and more together than most other bees, always likely to pick up as a group and move on as a response to stressful stimuli. These swarms also guard their hives very aggressively, with unusually large amounts of space around the hive alert for attack. 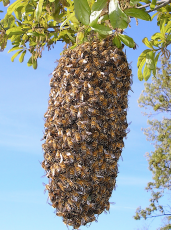 Compared to other bees, these swarms deploy much higher numbers for defensive purposes. While these swarms have spread over two continents, they can not last long without forage, so regions with dry summers or hard winters have yet to see these bees. Several deaths have resulted from encounters with these bees, including 2010 in Georgia, and 2013 in Texas. While they have spread, they have mixed with indigenous bees, but often kill the native queen and take over the hive for themselves. Due to the United States having colder weather climates in some places than the tropics though, the spread seems to have hit a wall. On the East Coast in particular, Africanized bees seem to go no further north than the Virginia Tidewater area. On the West Coast, some beekeepers have relocated from California’s southern half for the northern mountains to spare their populations exposure. Now that you have read this article, you know what killer bees are the next time someone mentions them. Know that they are aggressive, but their spread seems to be limited to certain states, largely in the South. If you have one on your property, then bee hive removal seems like an obvious thing to do. Life can seem a lot more pleasant without bees around. However, before you actually remove the hive, there are questions you need to ask yourself before you actually decide to do it. Keep reading to learn what these questions are. Is the removal of the bee hive truly necessary? Getting rid of a hive might look like a foregone conclusion, but don’t jump to that conclusion immediately. There are a number of criteria you should use in determining whether or not the hive should even be removed in the first place. The proximity of the hive to people and pets in the area is a determining factor. 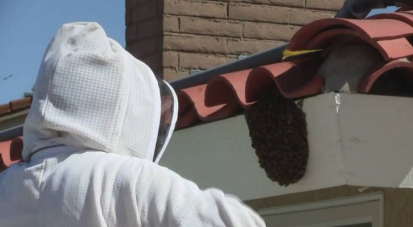 If the hive is near or on the home, or very close to a sidewalk where people walk through often, then removing it is usually a good idea, especially if there is a high risk of people or pets getting stung. If anyone in the proximity is allergic to bee stings, then removal of the hive is an absolute must. Anyone allergic to stings can suffer results ranging from passing out to even death. Beehives on or inside a home’s structure do need to go. A hive can carry from twenty up to eighty pounds of honey, which unremoved can ruin both ceilings and walls. On the other hand, if the bee hive is on the edge of a property where it is not really harming anyone, and especially if the bees might be necessary for pollination of plants also nearby, leaving it be is a choice. The national bee population has been in decline, so sparing any local bees that you can might help out the environment. However, if you are considering bee hive removal, it’s probably because the hive is a nuisance and needs to go, so don’t hesitate. The next question is then whether or not you should do it yourself or call in a professional. If you have the aforementioned allergy to bee stings, do not attempt it yourself under any circumstances. If you do choose to try it on your own, what gear do you need? For starters, wear clothing that is light in color and smooth in texture. Rough surfaces and dark colors aggravate bees, and you don’t want to do that, allergy or not. Using the same equipment as professional beekeepers is never a bad idea. Leather gloves and a beekeeper veil come in handy. Using a bee smoker might calm bees down and decrease your chances of a sting. Avoid scents like deodorant or after shave, so you don’t get confused with flowers. So, when is the best time to remove a hive? Early spring months or late winter are usually the time of year that the population is at its low point. Bees are also typically asleep at night and in the early morning hours. Now that you know the questions to ask yourself about beehive removal, you can figure out whether or not a hive on your property should go, and whether or not you should do it yourself. When you find a bee hive on your property, you might debate about whether or not it needs to be removed. You would probably breathe easier around your home knowing that it was gone and no one would risk being stung, but then again, removing it can be a stressful experience and expense you don’t want to waste money on. Keep reading to learn about the specific circumstances in which you need to call in a bee exterminator. If you, anyone in your family, a frequent guest or even a neighbor is allergic to bees, then you need to have a professional come in and deal with the hive. Individuals allergic to bee stings can suffer reactions that range from unpleasant to unconsciousness to even being fatal, depending on the level of allergy and how much venom they are stuck with. If you have pets that ever get outside, then you also have another reason to get rid of a bee hive. Curious animals might notice the scent or taste of honey and start exploring the hive, having no idea what response might be awaiting them within the honeycomb. Spare your kittie or pooch the pain and suffering, as well as sparing your wallet the trip to the vet. The price of a bee exterminator can often be much cheaper than your pet’s medication and doctor bills. The placement of a bee hive also matters. In urban areas, or homes with small yards and lots of foot traffic, removal is usually a good idea, even if the hive is not on or in a home’s actual structure. Alternatively, some rural estates, such as farms, might choose to leave hives that are on the property edges or in natural areas, just to keep handy pollinators around for plant purposes. However, this is a rare exception to the rule. Anytime you find a hive on or inside the physical structure of your home, the hive needs to be dealt with. While a bee hive might not look very big, it can hold tens of pounds of honey, which for all its sweet taste is very destructive to the interior structures of homes and buildings. Even if you’re concerned with the national decline of the honey bee population, don’t let your commitment to the environment prevent you from calling in a professional for a consultation. If it turns out that your local hive is honey bees, many bee exterminator services are actually able and quite willing to salvage such hives and relocate them to some place where they can remain useful but far away from you. If it turns out that your hive is bumble bees, ground bees or especially carpenter bees, then you need to have the hive and population within dealt with promptly. Calling in a bee professional promptly can spare your home and family unfortunate incidents and leave your future free of events that might sting. When you see a hive on your property, have it reviewed and removed if necessary. Among all of the pests, you will ever get a chance to encounter, it is bees that are deadly and can cause a significant amount of trouble for you and the property. Bees take it all out on you with their buzzing and it can be rather irritating. It is not just the irritating nature of their presence that is cutting, but the realization that they are not able to remain under your control. You won’t be able to cross their path and that is rough for a property owner. 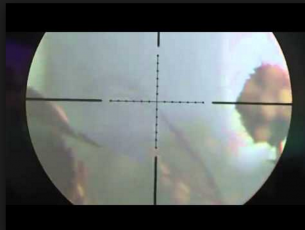 Look at what a great pest control service can do with regards to bee pest control . What is something the pest control service will do for you in terms of the colony. You need to find a colony and do this right away because you won’t be able to recognize this. If you are not able to find a colony, how will you know what to do? The heart of this issue will always be with the colony of bees that is somewhere near the property. This is where the bees will congregate and live when they are hoping to work away. The hive is how you get to the problem and deal with it. The service can do this for you. If one bee is left, this is all it will take for you to be in a spot of bother. It is uncomfortable to have even one bee roaming around and the worst part is that you are now going to have a bee that does not have a hive to go to. What will the bee do then? It will start to pester the humans that are around the property and continue to move about doing its own thing. This is how you start to notice it even more than you otherwise would. Getting the pest control to remove all of them is important. Pest control is challenging when speed is not being looked at. Bee pest control should be emphasizing speed because if the bees are not removed in a timely manner the property will not be inhabitable at all and this is not good. The property has to be cleared out within a set time and that is the responsibility of a good pest control service. The time is determined when the initial survey is done for the location assessing how the bees are and where they are located inside. Pests are tough and bees are even tougher because they will get into all sorts of locations and that can make the property a ‘no-go’ zone for most humans. If there are bees roaming around, they are a threat to one’s safety and health meaning you can’t just let them do their thing. You will need to speak with this service and have the bees removed in a professional manner. This is how pest control is done and it should be completed so you feel safe when you enter into the property once the job is completed and the bees are gone. Summer is a warm, inviting time of the year, where the weather is good and it’s a great time to be outside, whether it’s traveling cross country or simply lounging in your backyard. However, the warm season is not without its hazards. From large scale disasters drought and wildfires to more personal issues such as dehydration and heat stroke, summer brings with it a few hazards unique to the season. One particular hazard is the risk of insect infestation, Be they wasps, termites or ants, insects run rampant starting in spring and not dying in great numbers until the cold season starts. Bee keepers can help remove bees as well. Of all the insect infestations a home owner may one day have to deal with, bee infestations are among the trickiest. Unlike wasps and hornets, bees are economically and environmentally useful and are actually fairly reluctant to sting humans as doing so will kill them. However, they can definitely be a safety hazard just the same and few home owners want their walls or eaves to host a buzzing nest of bees, no matter how valuable their harvested honey could be. With this in mind, most home owners will want to get rid of bee infestations through the process of bee removal. Bee removal is a process more difficult then simply poisoning the infestation. Bee removal services must be able to take apart the infested area of a building and then, despite any heights, tight spaces or dark areas, carefully remove the bee hive and their honey combs (and with them the queen bee) no matter its size (and some bee hives can get quite large if the infestation is allowed to grow long enough) and transport it to a place where its wanted, usually a bee farm equipped to shelter bees and harvest their honey. Bees can be quite valuable animals in this capacity. However, there are some warnings to remember though. First, poisoning bees out of your home is usually a bad idea. While the poison will kill the bees, it will not do anything about the hive and its honeycombs. Further, the carcasses of the bees and their rotting honey will inevitably attract other vermin that are even less pleasant to feast on the decay left in the wake of a poisoning extermination job on a bee hive. On top of that, the honey will leak through the comb if not tended to by bees and leave anything from stains to large scale destruction as the weight of the honey and hive drag down building material, leaving the building’s owners with a sizable repair bills. Secondly, it is not a good idea to call for free bee removal. Despite the fact that many bee removers do profit from the insects, most bee farms offering free removal of bees are not very well trained in the practice, let alone the capacity to take apart and rebuild sections of buildings that need to be removed to extract the bees. Specialists in the field are preferable as they know about removing bees, rather than just harvesting their honey.